The video clip below is from the movie “Glory.” Whenever I think of the sacrifice of soldiers, and the courage they are asked to exhibit, I remember this scene. The scene portrays the night before the 54th Massachusetts Infantry – an all-black regiment fighting for the North in the Civil War – would lead an assault on a Confederate fort. Due the circumstances of the battle plan, the 54th is almost assured to be decimated in the fight. Thus, the men you see in the clip know that they will most likely die the next day. However, because of their strong desire to make a contribution in this war, they turn their fears into pride. They know that their bravery, and their sacrifice, will mean so much to the cause they are fighting for. The scene also reflects the internal struggle these former slaves had with their perceptions of themselves as men. For so long, they were considered inhuman – more like property or animals rather than men. As they bonded together, learned from each other, and were pushed by their leaders, they developed self-confidence and self-worth. The character portrayed by Denzel Washington struggles with this throughout the film, and the scene shows him finally voicing his understanding that he – and his fellow soldiers – are men who matter. What does this have to do with fraternity? Perhaps not much. I see fraternity in this scene. I feel brotherhood through their singing. I see leadership flowing back and forth amongst the men. I see how supportive they are of each other. We also should remember all of our members who fought for our nation, and those who fight today. The struggles we face as Greek-letter organizations are nothing compared to what real-life soldiers face each day. We should never make that an even comparison. The black men who stepped up to fight for the country that had treated them so poorly are examples of selflessness and dedication that none of us will likely match in our lifetimes. On this Veteran’s Day, we should all put our challenges in perspective. However, we can also learn from those who show bravery and courage through military service. 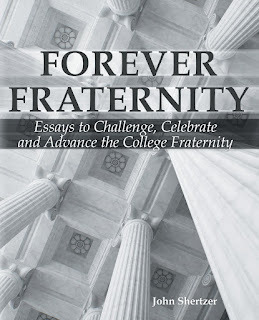 As I hear undergraduates complain about the amount of work it would take to build a stronger fraternity or sorority, I often want to remind them that there are men and women of a similar age, who spend their days loading up a weapon, putting on a uniform, and stepping forward into a day that they may never see the end of. We owe it to them, and those who fought before them, to strive to be as courageous and dedicated in our dealings. They should inspire us to greater leadership in whatever cause we are a part of. Morgan Freeman, through his character in the scene, references the impending battle as their great “gettin’-up” moment. What’s yours? It may be smaller than what these soldiers had to endure, but just like them, we shouldn’t shirk from that great and glorious opportunity. Below is a great new video from Phired Up Productions. Thanks to experience, advice, and observation, I'm starting to believe that the only way to truly solve the problems we face is to recruit our way out of them. The folks at Phired Up refer to those who drive positive change in our chapters as "horses," and those who resist change as "mules." The horses have desires, wants, and visions for a better fraternity/sorority. They may be able to get some of the mules on board, but in the end, they will find far greater success by recruiting new members (new horses) who share their vision. Instead of focusing our energy on how we get the mules out of our chapters, we should just manage their presence and charge forward without them. "Get on board, or get out of the way" should be the battle cry. What we focus on becomes our reality. How much time is drained by the energy we devote to the negative, apathetic, and uncommitted among us? What if that energy was focused towards those who understand the bigger picture and are ready to contribute? Or, those unaffiliated men and women who share our vision? NOTE: You need to have a vision first. Can you answer the questions that are posed at the beginning of the video? The practice of Appreciative Inquiry tells us that if we focus on problems, that's what we'll find. If we focus on possibilities instead, then we may find that they are more abundant. As the video points out, those "possibilities" may be the men and women we have yet to discover.